My worst iOS habit is hands-down my inability to keep my Camera Roll clean—I never go through it to delete my crappy selfies, random screenshots, or my 49 failed attempts at photographing Sleeping Beauty Castle at Disneyland at nighttime. (Even worse: I back up everything, so those same terrible photos live in various places on my Mac, too.) It’s been an ongoing problem that I can’t quite seem to kick, though I think I may finally be onto something: the answer to de-cluttering my Camera Roll is to clutter up my home screen with more apps. These three photo management apps tackle photo clutter in different ways, and combining the three together into a weekly routine has, so far, started to make a dent in my never-ending pile of photos. I take at least one screenshot on my iPhone every day, whether to use in an article, to save something for offline viewing (like directions from Google Maps, or a digital ticket stub), or to quickly snap something that I want to text to my friends—juicy iMessage conversations and ridiculous Facebook posts and pics that I want to privately share and have a good laugh. ...why did I even take these? But you know what that leaves me with? A cluttered Camera Roll filled with an ugly mess of screenshots that I no longer need, and that have been sitting there untouched for months. Screeny ($1) filters out these screenshots so you can easily delete them. It scans through your Camera Roll and grabs all your screenshots, which you can review before batch-deleting the whole lot. You could also delete them one-by-one, or filter them down further by the last 15 or 30 days, if you only want to delete older snaps. That option is a great buffer for making sure you don’t accidentally delete something you need. Screeny’s engine is super accurate—it’s really good at selecting only screenshots. But, just to be safe, I always review what Screeny has selected to make sure a rogue photo didn’t get pulled in by mistake before I hit the final “delete” button. That has only happened to me once, but I still take the time to look everything over first. 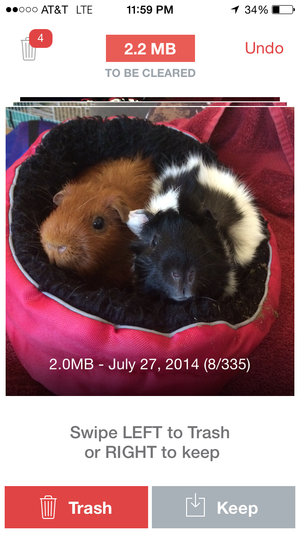 I’d rather not risk deleting my guinea pig photos before I can post them to Instagram—priorities, people! Guinea pig pics? Definitely a keeper. Swipe right. Screeny can’t help you deal with your regular photos, so that’s where Flic ($3) comes in. Flic shows you what’s stored in your photo collection—one photo at a time—asking, “Does this really look like a Kodak moment to you?” You decide what stays and what goes in a Tinder-esque fashion—swipe left to send a photo to the trash, or swipe right to keep it around. With each photo you dump, Flic tells you how much space you’ve cleared. Flic stores these “trashed” photos in a special tab until you’re ready to actually delete them, so you can take one last look at your pics before you send them into the abyss. And, to keep you from getting photo fatigued, Flic groups your photos together by calendar month, so you’re not sorting through your entire Camera Roll at once. Delete these photos, right meow. Once you’ve gone through your photos individually, take a look at your Camera Roll as a whole, and batch-delete duplicates or photos that just aren’t keepers. Purrge can help with that. 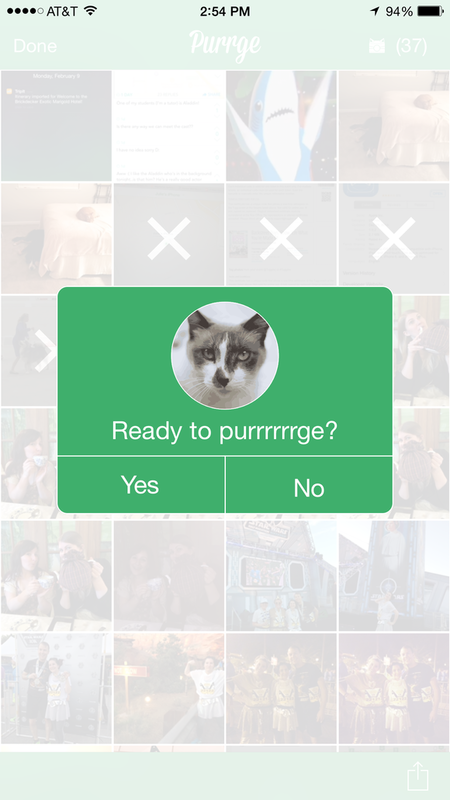 I wanted to write off Purrge ($2) as just a gimmicky app to take advantage of everyone’s cat obsession (Purrge? Really? ), but it’s actually a pretty great tool. 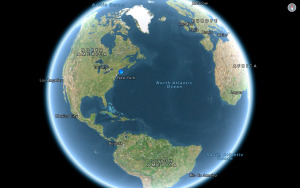 Purrge has a gesture-based interface, which you use to quickly batch delete photos from your Camera Roll. 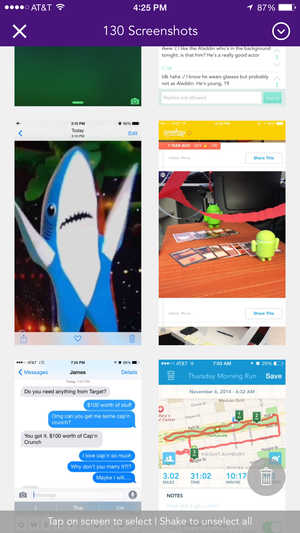 All of your photo thumbnails are shown on a grid; tap “select”, and then tap an image to mark it as trash, or swipe across a cluster of images to mark multiple photos at once. You can also look at full-screen versions of your photos one by one, and switch back and forth between similar images to pick the best of the bunch to keep. Swipe up on any full-screen photo to delete it. When you’re ready to trash everything, tap the Purrge icon at the top of the screen, and you’ll finally get to see that cute cat photo that the app promises—that is, if you don’t have a zillion cat photos on your phone already.